This "movie" of Pluto and its largest moon, Charon, was taken by NASA's New Horizons spacecraft as it raced toward Pluto in July 2014. Covering almost one full rotation of Charon around Pluto, the 12 images that make up the movie were taken July 19-24 with the spacecraft�s best telescopic camera - the Long Range Reconnaissance Imager (LORRI) - at distances ranging from about 267 million to 262 million miles (429 million to 422 million kilometers). Charon is orbiting approximately 11,200 miles (about 18,000 kilometers) above Pluto's surface. Why the slight "wobble" of each body in the images? Pluto and Charon constitute a true binary planet - a more extreme example of the Earth-moon system. Because Charon is about 1/12th as massive as Pluto - the largest moon in the solar system relative to the planet it orbits - both Pluto and Charon orbit a gravity point (called a barycenter) between the pair. The movie's frames are centered on that point, showing the "barycentric wobble" of the system as Charon orbits. The National Academy of Sciences cited the binary nature of Pluto-Charon when ranking this mission highly for a new start in the early 2000s. 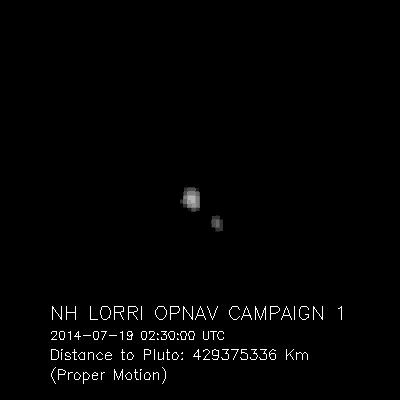 Now, New Horizons is seeing the binary system beginning to emerge in its own cameras.